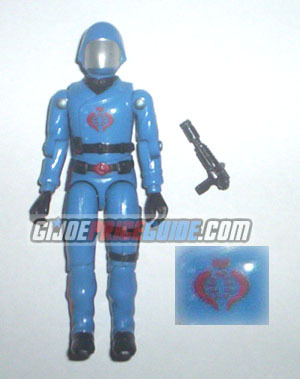 NOTES: The straight-armed first version of Cobra Commander came in two variations. The earlier and rarer figures, like the one above, came with a different cobra symbol and are commonly referred to as Mickey Mouse Cobra Commanders because the top of the symbol resembles a Mickey Mouse head. The symbol often shows damage, as does the silver paint on the mask. A mint example of this figure is hard to find and highly prized by collectors. The gun is a dark grey.